I had a debt to pay for our successful Antarctica landing. Besides Shackleton and Neptune, another larger-than-life being had been guiding our expedition. Now, on Antarctica, I could finally follow through with the favor I had promised to Atlas. When she arrived, I glanced down at the guano-stained snow. The penguins on the lower section of the glacier added an unexpected element. Had I been thinking, I would have made use of the clean snow near the summit. Oh well, a promise is a promise. I leaned over, pushed the top of my head against the glacier, propped my hands out on either side for balance, and lifted my legs straight into the air. 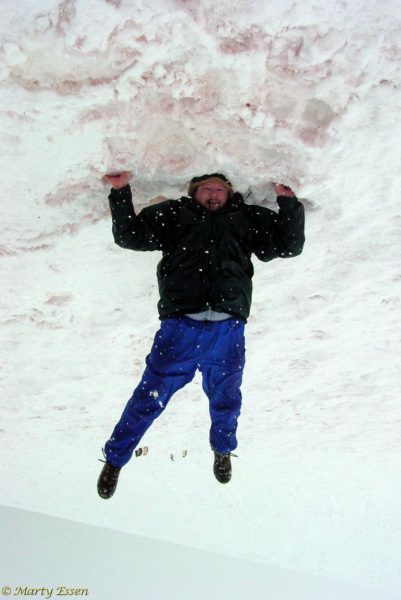 Anywhere else I would have been doing a headstand, but here on Antarctica I was holding up the world! Perhaps you remember a brief unexplained sensation of falling on February 21, 2003. I could only hold the world for a few seconds—just long enough to provide a short break—and Atlas wasn’t ready to get it back so soon. We almost fumbled the exchange.